Alex Garcia '17 touring us around the Ford GoBike office and warehouse. Riho Kawamoto, class of 2021, is interested in Sociology and French Studies. Cynthia (Xinyue) Zhang is a freshman from Shenzhen, China and a prospective major in the College of Social Studies with a minor in Data Analysis. You can always find her procrastinating over her History and Philosophy papers or binge drinking boba tea. The Ford GoBike is a bike share program in the Bay Area, sponsored by Ford. Our visit to Ford GoBike was much looked forward to as we actually had the chance to bike on Ford GoBikes the same day, and it was a great experience. Cynthia was especially excited to visit GoBike because the bike share system has been super popular in her home country China and she wanted to find out the difference in how such program works in the U.S. The Ford GoBike office has several dozens of employees and is integrated with a warehouse where their bikes are stored. 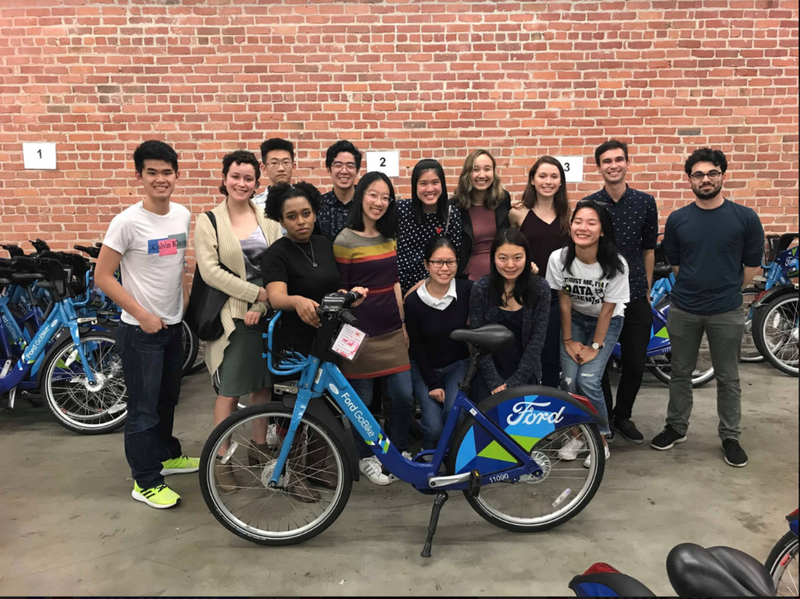 Alex, the co-founder of Kai and a new grad majoring in East Asian Studies from Wesleyan class of ’17, gave us a presentation on how the Ford GoBike system works and what he does as an outreach co-ordinator in the expansion team. In his job, he reaches out to different neighborhoods and persuades people into agreeing the establishment of new GoBike stations. What impressed us the most was his detailed descriptions on all kinds of objections he received when knocking on doors and talking to people, ranging from grievances on parking, not wanting to let people from other socioeconomic backgrounds into the neighborhoods, to not liking the color blue (color of the Ford bikes). It gave us a sense of how important communication skills are in a day-to-day career setting and how the Ford GoBike, a technology company often has to deal with political issues. After the presentation, we broke into two groups to talk to Alex and two other alums, Saul Carlin ’09 and Pi Paticha ’17. Our group talked with the younger alums, Alex and Pi first. We asked questions about job-hunting and the recruiting process and the shared anxiety on not knowing what to do after graduation. Alex shared his story of graduating and moving to San Francisco without a job but through starting from the basic he finally found his current job. He’s been passionate about creating transportation equity since Wesleyan and he sees his job as a great way to put ideals into practice. An Economics major hailing from Thailand, Pi ‘17 currently works as a marketing strategist in a multi-cultural business firm. She shared with several international students in the group about how she found her current job and the visa logistics. She encouraged us to fully utilize the Wesleyan network and not be too pessimistic about our future as international students (a much-needed advice). Their stories gave us a clearer image of transitioning a new environment (workplace) from college. We then talked with Saul ‘09, a government major and now the founder of Subcast, a small startup that manages a smart podcast radio for Alexa. He shared his thoughts on how college students can spend their time and how invaluable the soft skills he learned through a liberal arts education at Wes are in his career. Reflecting on his college life, he said students should do what they are interested in, rather than just doing what they think they should. While at Wes, Saul was the vice president of WSA and helped his friend run for election, through which experience he gained the communications skills essential in all the positions he has worked in. When talking about his path to the Silicon Valley, Saul described his interest to have changed several times after college, and in his current job, he finds a way of intersecting his interests in media, politics and tech, which he is very excited about. Like several other alums we heard from, Saul taught himself coding and software engineering skills while at work, which convinced us on the plausibility of learning something while doing it, and also expelled the myth of “You have to major in certain fields to enter the tech industry.” Hearing the stories of alums across class years and majors, we learned about different approaches in finding/establishing career paths and are excited to start thinking about our own.